Sports Minister Chishimba Kambwili has abused his ministerial powers by grabbing a huge chunk of the Roan Antelope Golf Course and has turned it into a personal property. The Roan MP who recently bought 10 cows and goats says he has taken over part of the golf course because the infrastructure is not active. Kambwili who is slowly losing popularity because of his arrogance on his constituents intimidates whoever questions why he has taken over the infrastructure without the consent of the local authority. 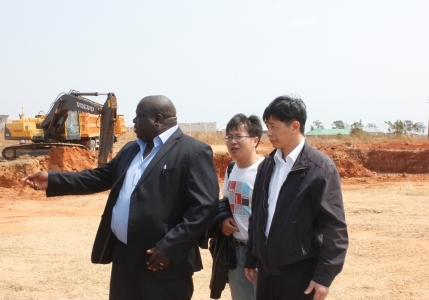 It has come to our attention that Kambwili has plans of grabbing another huge chunk of land as he intends to bring more animals at his new residence in the golf club. As members of the community, we are appealing to the President to cage the Sports Minister because he is doing things without reasoning just because he is a minister. With the rumors taking rounds that he intends to take over from President Sata in 2016, what kind of a leader is he going to make if we can visibly see his immaturity. We, the local populace, expect the Minister of Sports to help to revamp the sport in the district which is at its lowest ebb because currently the club is facing financial constraints. As concerned residents, we were disappointed when we visited the golf club only to find cows and goats grazing in the golf course. His confidants equally are disappointed with Kambwili and confirmed that the animals belonged to Kambwili who intends to turn his newly-built residence in ‘W’ Avenue into a farm house and extend it further. Our fellow countrymen and women, is this the style of leadership we expected when we ushered the Patriotic Front into office last year? Your guess is as good as ours! Turning public infrastructure into person property? Only this week, Kambwili was on ZNBC TV accusing former Southern province Minister Alice Simango of having illegally obtained the recreation facility in Livingstone when Simango at least has some legal backing as stated by the Town Clerk. The golf course in Luanshya’s mining town, as we are aware, is now limping and there is no one to revamp the sport because even the owners of Luanshya Mine have put a deaf ear on the demands by the community to take over the infrastructure. None availability of sponsors of the golf club cannot guarantee Kambwili to take the law into his own hands by taking a huge portion of land as if it were his. We voted for PF to see positive changes but the changes we are now witnessing are government leaders enriching themselves on the expense of the poor. President Sata should show leadership by caging and disciplining Kambwili and other ministers who are denting the image of the ruling party. We have been reliably informed that Kambwili is intending to meet the local authority so that legal documentation is prepared for him to be the legal owner of the piece of land he has grabbed at the golf club. If you are one of those living in the north of the town of Luanshya you can truly attest to what we are talking about because cows are visibly seen when you are crossing the bridge coming from new town. Our humble advice to Kambwili is that he should apply to the council for a farm land elsewhere unlike using ‘Jerabo’ mentality to grab a property which belongs to the community.